Smoke from the fire could be seen for several blocks. WASHINGTON - A large fire heavily damaged two businesses in Georgetown Tuesday afternoon. 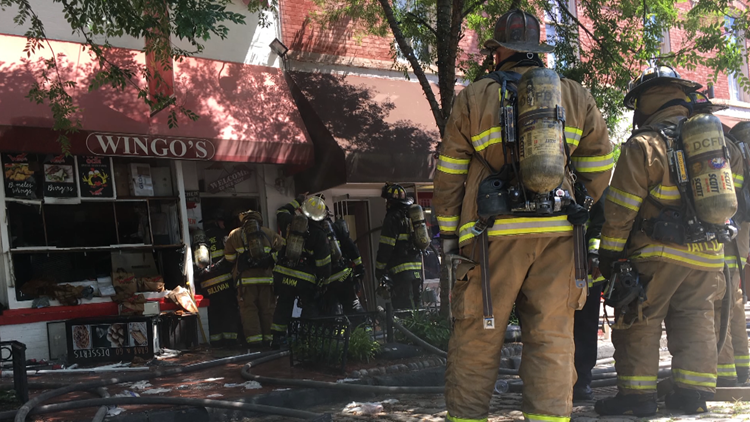 D.C. Fire and EMS said the fire started in the kitchen at Wingo’s Restaurant on O Street Northwest. It quickly spread to The English Rose Garden flower shop next door. Smoke from the fire could be seen for several blocks. D.C. Fire crews called in extra units from outside the city to help contain the 2-alarm blaze. A flower shop employee said he was working inside the business at the time, when suddenly he smelled smoke and couldn’t breathe. Two firefighters were transported to the hospital with minor injuries. Photos from the scene showed other firefighters cooling down and rehydrating after extinguishing the fire on a day where the temps hovered around 80 degrees. Fire investigators determined the fire was an accident. Wisconsin Avenue was shut down for several hours while fire crews put out the flames.